Today's post is about a letter written on November 4, 1861, by "Ipse Dixit" (suspected to be hospital steward John. B. Chamberlain) published in the November 9 Lancaster Inquirer. 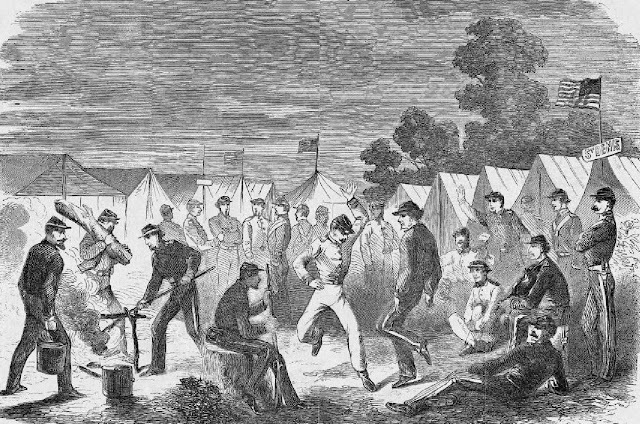 The regiment continued to settle into its first real camp, Camp Nevin, about fifty miles south of Louisville, Kentucky. The health of the regiment's soldiers. Combating illness will be important test for the regiment, especially as conditions deteriorate over the next few months. The 79th Pennsylvania seemed to think itself as doing better than average thanks to Col. Hambright's strict orders for the regiment, but disease would still have a deadly impact on the regiment in the winter of 1861-2. Col. Hambright's health. This would be off and on between 1861 and 1865, and would cause some political problems down the road. The Army of the Ohio. General Sherman would be removed in less than a week, and one of the first actions of his successor, Don Carlos Buell, was to reorganize the army. A month later, Buell announced divisions for his army, and Alexander McCook would become the 79th Pennsylvnia's division commander. Regimental pride in the 79th Pennsylvania. The regiment certainly prided itself on being one of the best drilled in the army. Mr. Editor: We are again encamped on the tented field, with the clear sky above, and a mixed secession and Union population for neighbors around, with a great desire pervading the men to have a brush with General Buckner and his rebel horde. In my last letter I stated that o'er night we would be in sight of the enemy; but we were compelled to bow to circumstances, as our advance was impeded by the burning down of a bridge by the rebels. A large force is now employed rebuilding it. We are now laying about fifty miles on the other side of Louisville, and will remain here until our pioneers open the way. Then we may have an opportunity to fight secesh; but not till then. We have very heavy white frosts here. They look like young snow storms. Camp life, with all its troubles, trials and pleasantries is now fully inaugurated. During the day, drill is the general order; until the men have made rapid advancement, and are now quite proficient. But in the evening, the ingenuity of each one is taxed to produce some new scheme that will aid in passing away the time. Quite a number of singing clubs have been improvised for the occasion. There is also a fine musical instrumental quartette in which figure Capt. Locher, as flutist; Dr. Albright, violinist; Capt. Clemens, of the bad, and another instrument to fill up. They make tip top music. On the 28th inst., the whole brigade was reviewed by Generals Sherman and McCook; and as it filed by, it was the general remark of a number of officers that Col. Hambright's regiment was one of the best in marching and made a finer appearance than any of the others. I presume you have heard that Col. Hambright is unwell. I think it was a return of that old disease he contracted while in Mexico. He is now somewhat better. Every day a number of the secesh fraternity are escorted to General M'Cook's quarters to receive proper attention. He has the telegraph communicating with him; it will follow him in all his marches.